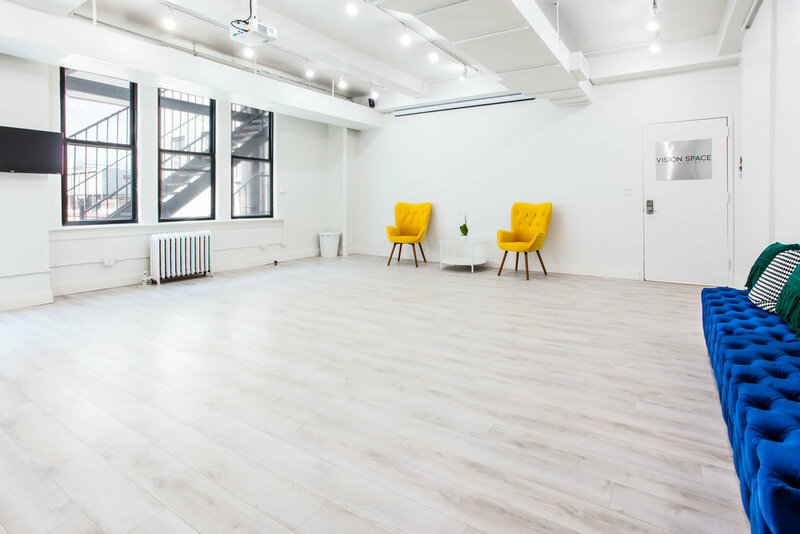 Vision Space NYC is a creative studio and intimate event space located in the heartbeat of Manhattan, Times Square. A blank canvas to bring your vision to life. Our space is designed in the simplest of ways to cater to the versatile needs of our clients. The white walls and light wood floor provide a bright, modern, and minimal space. Our track lighting system allows for the customization of the color and intensity of the lights. The tufted yellow chairs and navy benches add a pop of color to the environment. In the back of the space there is a curtained changing room for your privacy & convenience. Our combination pantry-closet features a mid-sized refrigerator & freezer, a microwave, and water cooler. Vision Space NYC is located in Times Square and just blocks away from the Garment District. 2018 Copyright Vision Space NYC. All rights reserved.